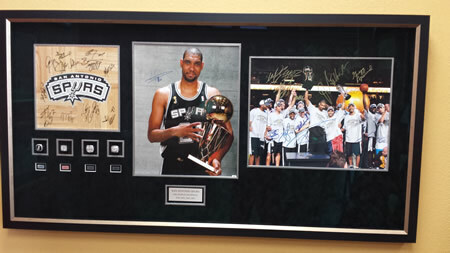 We provide custom framing and matting, conservation glazing, shadow boxes, canvas stretching, float frames, custom sized bevel mirrors, photo frames, and more to the Great Dallas Fort Worth area. We have over 2000 custom frame choices to enhance any piece of artwork or picture, so your choices are virtually limitless. We use only the best materials and techniques when individually handcrafting your custom picture frame. All our work is done on premises, and we spend time with you to make sure the finished product is something you will treasure for a lifetime. When you use us, we will change the ordinary into the extraordinary. And most work is completed in one week or less. We also offer original and limited edition artwork that can be purchased and framed to your taste and décor needs. Or, you may have some valuable possessions tucked away in the attic or stored in a closet…maybe some needlepoint, sports memorabilia, or other antiques? They can be proudly displayed in a shadow box or other wall décor so that the family heirloom could really be appreciated. If you have a wall that needs to be filled, we can help! And if you’re in a time crunch, we have 24 hour service available and we can arrange for pick up and delivery if needed. We also serve corporate and business accounts. We are proud of our selection, and customer satisfaction is our top priority. You won’t be disappointed that you stopped in. Come by and see us! !